This guide highlights a variety of tools to help with language studies. This guide is intended to provide a variety of resources in the library that can help improve your language skills and studies. There are also resources to assist those for whom English is not their first language. Use the menu to help you find the types of resources you need. There are other research guides dedicated to resources for a specific languages that may also be useful to you. 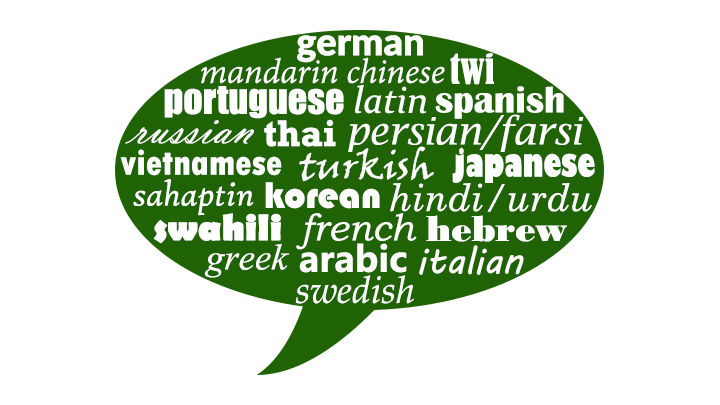 The UO Libraries directory allows you to sort by language to see who in the library can speak and/or write in various languages. Just use the drop down menu on the left under "Language Areas" to select your preferred language. You may also want to look at our Subject Specialists list to see who in the library is the designated specialist for the language you are interested in.